It’s been said that the presence of change is the only thing that never changes. Mergers and acquisitions are a kind of change that many agents and brokers have to face at some point in their careers, whether they embrace it or not. No matter if the situation involves two smaller firms joining forces under one banner to increase exposure or a national brand looking to expand, the process requires a period of adjustment for everyone involved. It’s been a busy couple of years for brokerage mergers and acquisitions. 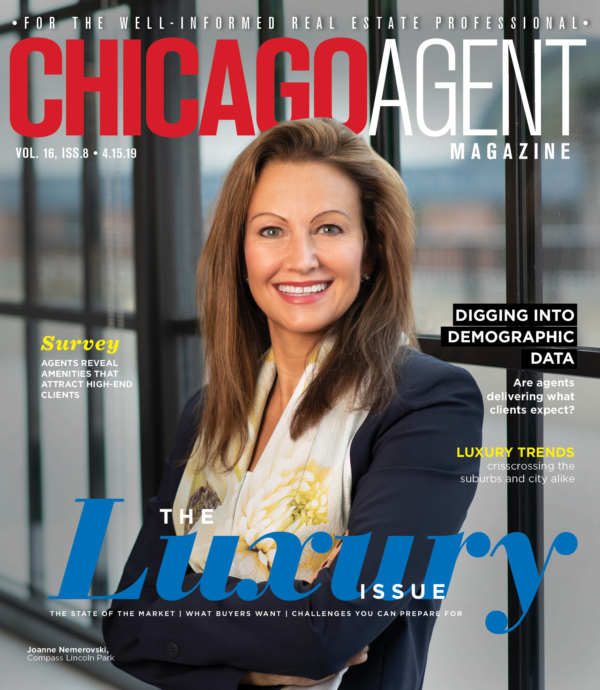 Compass made a lot of noise by entering the market and hiring away several top Chicagoland agents from just about every major brokerage in town before outright buying Conlon Real Estate last May. A few months later, the New York-based firm bought the North Shore’s Hudson Realty. In November 2017, Oak Park’s Gloor Realty was bought by Coldwell Banker (more on this transition in the sidebar on page 16). The following month, Ryan Hill, a Naperville-based brokerage, began flying the Century 21 flag. Two different affiliates of Berkshire Hathaway, Starck Realty and Visions Realty, merged in December 2018. And just last month, Gust Realty of Glen Ellyn joined Ryan Hill as a Century 21 affiliate. Steve Murray, president and owner of REAL Trends, a Colorado-based firm that values brokerages and brokers acquisition deals that usually involve firms with 50 or more agents, said that as recently as 18 months ago, his firm was carrying out 10 to 12 valuations per month and would be hired to sell two or three of those firms. Those numbers have jumped to 25 valuations per month, with four or five brokerages across the country tapping the company to handle a merger or acquisition deal. “There are between 28 and 30 sales right now that we’re at some stage in the process of handling,” Murray said. “This is by far the busiest we’ve been in about 30 years of doing this.” Murray attributes the increase in acquisitions to two main factors. First, many brokerage companies are showing a willingness to increase the share of commissions that go to agents. And second, more of the business is being done by a smaller number of top teams and agents. It all adds up to an increasingly competitive environment — and one in which scale can make the difference between growth and stagnation. Everything from technology platforms to corporate relocations can be leveraged on a national scale, making this a hard time for smaller firms to compete. And if recent predictions of a softening market bear out, that reality may only accelerate. Murray said this dynamic applies at every level of the business, from individual agents to entire firms. “Anytime you have a flat to declining market, it’s the better agents and the better teams that pick up market share. And the same is true for brokerage companies,” he said. While the changes associated with an acquisition can be exciting for some, it’s a source of trepidation and stress for others. Some agents embrace the change. Some dread it. And many others may not be excited by it at first, but are willing to put up with the disruption and will look for silver linings as they seek out new deals. Last October, Berkshire Hathaway HomeServices KoenigRubloff Realty Group acquired Weichert Realtors’ Nickel Group, a firm that managing broker-owner John Lawrence started in 2006 and ushered through franchising with Weichert Realtors in 2008. Lawrence said that the acquisition process took about six months from the first conversation to its completion. He initially believed that it would be difficult to relinquish control of the firm that he had kept growing through the recession and in the years that followed. Hoffman said that the months leading up to Ryan Hill’s acquisition were somewhat awkward because some people in the office knew about it and others found out when a formal announcement was made during a special event at the office. But if anyone was nervous about the transition or expected a more corporate vibe once the deal had closed, those concerns were allayed on the day that the big news broke. Culture may be an even more important consideration for managers. Lawrence ultimately chose to be acquired by Berkshire Hathaway because of the connection he felt with the people he would be working with and what he saw as an alignment of the company’s culture with that of his own firm. Mergers and acquisitions do offer the possibility to agents and brokers of getting a more extensive level of support at the back end than was present before with their previous company. But also, experienced agents should enter the acquisition process with the full realization that they will likely have to become accustomed to different ways of doing business. There will be new systems to learn and fresh branding to consider. Going through the acquisition process doesn’t have to be stressful. Deborah Hess was a broker was with Conlon Real Estate when Compass acquired that firm last spring. She said Compass took the time to onboard Conlon’s agents individually. Compass frequently held one-on-one and group sessions when new tools or procedures were introduced as a way to make sure everyone was ready to move forward. Broker-owners can also benefit from a more widely recognized brand that can help open more doors and drive new business. And the prospect of having a more robust support staff to help out can be tantalizing. But finding the right match can take time. Managing brokers should do all that they can to make sure the company that wants to acquire them is going to be a good fit for them if they are aiming for longevity in a rapidly changing business.